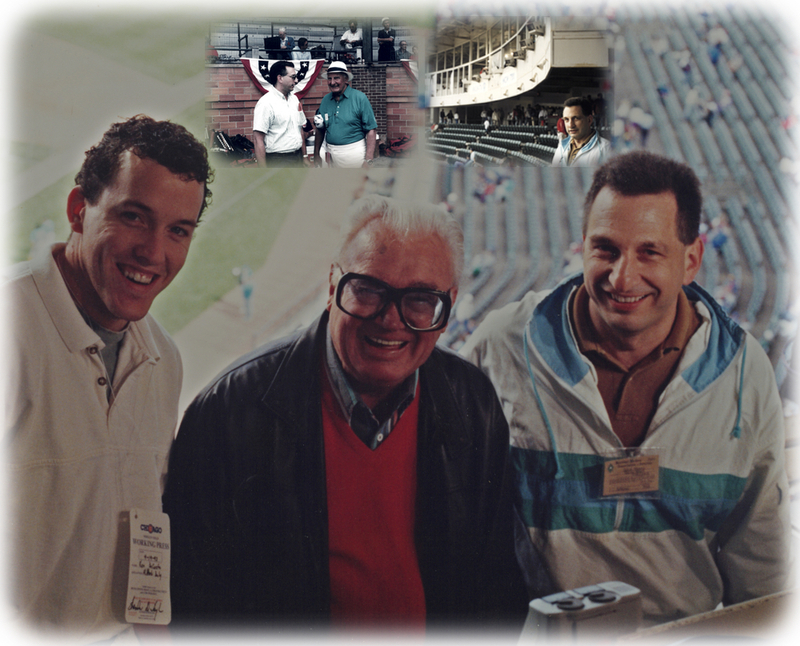 Photos: top left: David Maril with the late Chuck Thompson, the voice of the Orioles and Colts, the summer he was inducted into the Baseball Hall of Fame in 1993; top right: a perspective shot of Maril at Wrigley Field; featured photo: journalist Ken Decoste with the late, great Harry Caray and Maril. Who are these diehards sticking with Trump no matter what he does or says? Is ‘Blue Bloods’ star Tom Selleck in the running for Trump’s new FBI Director post? Why won’t Trump release his tax returns to end ‘witch-hunt’ investigations of alleged Russian ties? YOU KNOW WHAT'S the worst part of US Olympic swimmer Ryan Lochte’s boorish, immature and stupid behavior representing this country in Rio De Janeiro? It’s the media’s reaction in this country. The coverage focus has been primarily on damage control and how the 32-year-old over-hyped celebrity could save his endorsements and marketing career. The message seemed to be that he needed to “get out in front of this” and apologize. “Americans are forgiving if you admit your mistake and take responsibility,” one commentator said. The apology was all about him saving his career. But what about apologizing because it is the right thing, as a decent person, to do? It turned out that Lochte’s apology, a few days late, had all the sincerity of a press release written by a corporate flunky. It was carefully scripted to avoid the fact he twisted the facts, lied, and embarrassed his country and the other American Olympians while committing rowdy, late-night bad behavior. And maybe he will get away with all of this. In short, with his thick skin and ability to avoid accountability, he looks like he is prepping for a long, successful career in politics. One certainty is we are continually reminded the Olympics are not just about the thrill of victory and the agony of defeat. Lochte, and his swimming crime-mates Jimmy Feigen, Gunnar Bentz and Jack Conger, have to share the stage with other Olympic characters who didn’t exactly achieve gold-medal standards for behavior. Several boxing referees and judges had to be removed from the competition after their decisions were reviewed. Then there was Patrick Hickey of Ireland, called Europe’s top Olympic official, who was arrested for scalping tickets. Except for the fact he kept the job as baseball commissioner for a long time because nobody wanted it, Bud Selig did a pretty mediocre job. He was way behind on recognizing the use of steroids and banned performance enhancers and indecisive taking action in other significant areas. However, Selig may end up looking like a giant compared to his successor, Rob Manfred. The new commissioner is concerned about the length of games and said he is contemplating shrinking the strike zone, limiting the number of pitching changes in a game, curtailing the number of defensive shifts and installing 20-second time clocks for pitchers. These are absurd ideas. Why should a commissioner start dictating to managers what defenses they should set up in the field? Getting involved in strategy, such as pitching changes, is even more ludicrous. If Manfred really wants to speed things up, he should cut down on the time between half-innings, when TV and radio squeeze in minutes of extra commercials, stopping action. He won’t do that, however, because commercials mean revenue. Another area he could consider is technology. Since it is taking over the umpiring, why not get the arbitrators off the field and have everything automatically called by machine, including balls and strikes, eliminating the inconsistency of the umpires? This means calls are made instantly and are final. There’s no need to hold up the game for 3-5 minutes to have a play checked on replay back in New York. IF A PRODUCER ever decides to make a movie about the late Yankee owner George Steinbrenner, the perfect pick to play the volatile, irrational, unreasonable and bullying figure would be Donald Trump. Both made firings and management shakeups part of their agenda. It would be interesting to hear Paul Manafort, Trump’s ousted campaign manager, compare the unstable conditions of working for the GOP nominee with the cloak and dagger political intrigue of being an inside consultant in the Ukraine. If Billy Martin, the manager Steinbrenner loved to hire and fire, was still alive, he’d have been perfect to replace Manafort in Trump’s campaign organization. Chances are Trump would be available to star in a Steinbrenner movie. If he doesn’t completely self-destruct before the first of the nationally televised debates, the one-on-one moderated confrontations with Clinton figure to end his presidential aspirations. Hillary is tough, bright, and well-informed. These debates will be a lot different than the Republican primary match-ups. Without a dozen second-rate Republican presidential wannabes flanking him and serving as a target for his insults, Trump’s ignorance of the complexities of foreign affairs, domestic issues and how government works will be exposed. If he tries to bully Hillary with his rude, heavy-handed manner, he’ll be even more unpopular with the reasonable electorate he has been unable to attract. NO MATTER WHAT you think of Trump and the front-running Republican leaders who won’t jump off his bandwagon until they are convinced he will be pummeled in the election, the party chairman Reince Priebus deserves a lot of credit for diplomacy. He has handled an impossible job, trying to serve all aspects of the party, with precision and skill. On the other side, the Democrats, with the abrasive, obnoxious and ruthless Debbie Wasserman Schultz, had a party leader who was ousted because of her favoritism to Hillary Clinton. Wasserman Schultz is such an unlikeable figure when she is on camera, she makes Hillary seem kind and trustworthy. The ever capable Donna Brazile, who was called in to replace Wasserman Schultz at the start of the Democrats’ convention, wasted little time cleaning house and getting rid of the officials who were unfairly working behind the scenes to keep Bernie Sanders from getting the nomination. HILLARY CLINTON DRAGGING Colin Powell into her email controversy, claiming the highly regarded former general and Secretary of State had advised her to use her own personal computer, reenforces her lack of character issue with many voters. When Powell was in office, it was a different time and there were different conditions. As always, Hillary is adept at twisting facts and selective use of information to avoid her own accountability. BARACK OBAMA IS A BRIGHT, well educated person. It makes you wonder, however, if he has any respect for the intelligence of the American voters when he calls Hillary Clinton the best qualified and prepared person to ever run for president. It’s fine for him to offer a robust endorsement and tout the skills and aspects from her background he feels she would bring to the presidency. But come on, doesn’t he realize how much credibility he loses among voters with such a broad-sweeping, ridiculous generalization? Words do matter and Obama comes off as nothing more than a shill, obsessed with keeping her focused in protecting his legacy. Looking at the history of the presidency, she is not even in the top 15 as far as qualifications going into the job. HOWEVER, ON ANOTHER ISSUE, Obama deserves the benefit of the doubt with his insistence that the timing of the $400 million payment to Iran was leverage to free three American hostages but not ransom. If indeed this repayment of Iran money that had been frozen was agreed upon a long tim ago, it made sense to hold off delivering the funds until the Americans were put on the airplane. If the payment had been quickly made and Iran held off releasing the prisoners, critics who are blabbering that a bad precedent has been established paying ransom, would have been all over Obama for missing an opportunity sitting there to insure the release of the Americans. DON’T YOU THINK it is time for Liberty Mutual to give the Statue of Liberty a little bit of a break and stop using the iconic structure in its TV insurance commercials? The historic statue deserves better than appearing over and over again in the background of so many television pitches for car insurance coverage. David Maril has been a columnist, sports editor and copy editor at three newspapers published in Massachusetts, winning numerous writing and section-design awards. As sports editor of the Milford Daily News, he covered the Boston Red Sox, Celtics and the New England Patriots. At the Brockton Enterprise he served as vice president of the newspaper’s guild, dealing with contract negotiations and workforce issues through difficult economic times. He also served on the board of the Boston Chapter of the Baseball Writers’ Association of America, where he is a lifetime member and voter in Major League Baseball’s annual Cooperstown Hall of Fame balloting. For several years was a columnist for Voice Of Baltimore. The son of the late artist Herman Maril, whose work is included in over 100 museum collections, David splits his time between Cape Cod, MA and Baltimore, MD. He currently serves as president of the Herman Maril Foundation, which supports curatorial projects, art education programs and exhibitions related to the study of his father’s work. The website, featuring his father’s artwork, is hermanmaril.com. A graduate of Park School in Brooklandville, MD, David majored in English at Clark University in Worcester, MA. If you wold like to comment on this blog David can be reached at david@davidmaril.com.